The sign of tradition is also the sign of revolutionaries. The sign of reserve is the one associated with the impressive debauchery of the Roman festival of Saturnalia. Saturn, your ruling planet, is considered the very stalwart of stuck, but is in reality the most dependable agent of change. You are similarly versatile, embracing the new with a mix of eagerness and skepticism, and honoring tradition as a source of information about right now. That, and you think that old books smell interesting. You probably sniff every old book that you pick up. Capricorn is crispy on the outside and deeply sensitive on the inside, a fact which most people may miss and which you would do well to inform them (by your actions), so they know. You prefer the squishy kind of person as a partner, as in emotionally open (in a way that seems daring to you), but they also have to inhabit their gender in a conscious way. This is the sign of the winter solstice, associated with the dark days of impending cold; you love the security of the home fires burning. 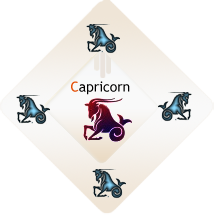 Capricorn is an earth sign, of a cardinal type; the planet that rules your sign is Saturn. Study the position of Saturn in your chart and you will learn a lot about yourself.